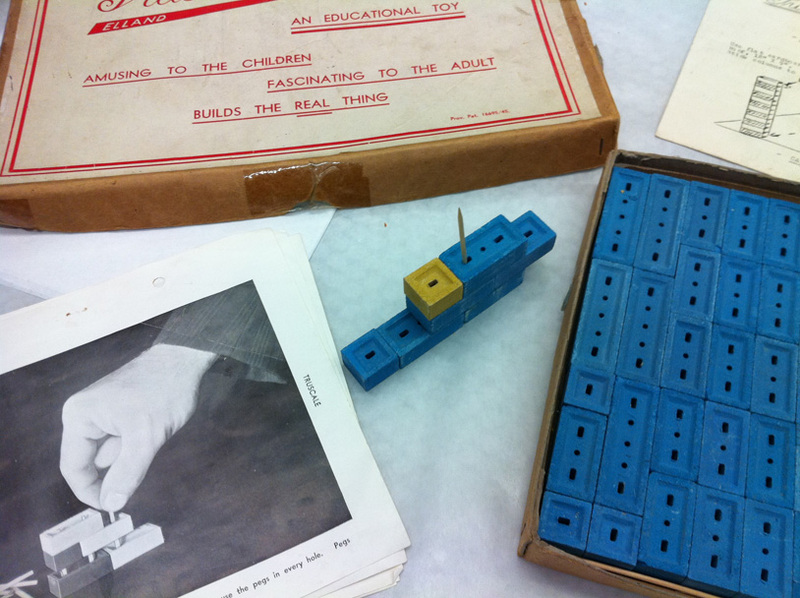 National Building Museum Fellowship Update #2: The Merits Of Missing Pieces. Let’s get one thing straight, despite the manufacturer’s claims that their Truscale Blocks are amusing, interesting, attractive and absolutely bubbling over with unlimited possibilities for building, they are not. For many reasons, Truscale Blocks are truly remarkable but aesthetically and functionally, they are one of the least appealing building toys in the National Building Museum’s tremendously impressive collection. The colors of the brick-like building blocks are neither realistic nor inspiring, in fact, they must have been remarkably drab for children in victorious but dreary post-war England. The connection from brick to brick manages to be flimsy and over-designed to the point of being limiting. The building instructions? They might as well have been hand drawn by a second-grader on a napkin over lunch. Nevertheless, the Elland Company’s Truscale Blocks are one of the more interesting pieces in the National Building Museum’s extensive collection of over two thousand building toys. Marketing hyperbole aside, the Elland Company is remarkably forthright, even celebratory about what’s not included in the building set or its instructions. Hamstrung by material shortages and lean times in England after World War II, they claim that they are temporarily unable to provide such things as pre-made windows, roofs and doors for their building kits. A vast majority of the toy manufacturers represented in the Museum’s collection assert that their toys stimulate creativity and invention, and even challenge their users to be inventors. However, they all struggle mightily to try to define what invention is or to create a tangible framework for how it might occur. The most constructive arguments are made by the manufacturers of early to mid-century engineering sets such as Meccano and Erector when they suggest that users invent means for exploring outer space. Nevertheless, when running engineering and innovation competitions, the very same manufacturers of these toys, such as the A.C. Gilbert Company, awarded their prizes to the most accurate representations of existing everyday life such as battleships and wheelbarrows. The makers of the architectural building sets, prime users of the word ‘invent’ in their literature, fail to use the most basic and American of constructs to describe architectural innovation; the tallest building. And yet with Elland and their wayward Truscale Blocks, we have a compelling challenge, a clear statement of what innovation might be and a process for growing a larger culture of creativity and thoughtful re-use. In this way, the Truscale Blocks are a truly unique and remarkable piece of the Museum’s collection. 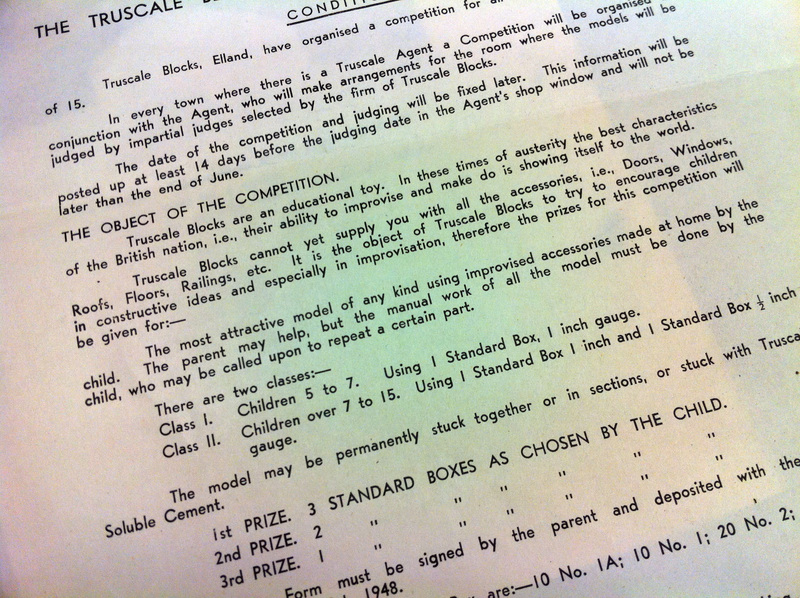 I have no idea what the end results were of the Elland Company’s regular competitions but, if properly administered and celebrated it’s not hard to imagine either the ‘oohs and aahs’ or the truly meaningful skills gained by the participants.